Headquartered in the US, the client leverages innovative technologies to help its Quick Service Restaurant customers grow their business. They specialize in three critical components; Real-world Retail experience, Advanced qualifications in Business Management & Technologies, and Customized IT solutions. The Azure IaaS solution helped create a secure, reliable & scalable environment, which provides high availability of 99.95% uptime SLA. It reduced hosting costs by 25% and enhanced the speed of applications by 25%. The solution also ensured data recovery and implementation failover, in the event of any catastrophe assuring that their business will keep running. While developing innovative SaaS applications for Quick Service Restaurants (QSR), the client faced massive challenges with co-located data center, where the production workloads were hosted. The client’s web server would go through periods of high downtime resulting from unplanned or unexpected events. The second major concern was an unreliable DNS server which would redirect unresolvable names to searched websites. Their web server was unstable resulting in an inability to map the path component of a URL. Adding to their worries was an unreliable and extremely slow internet connection that would frequently just flat and not load anything. 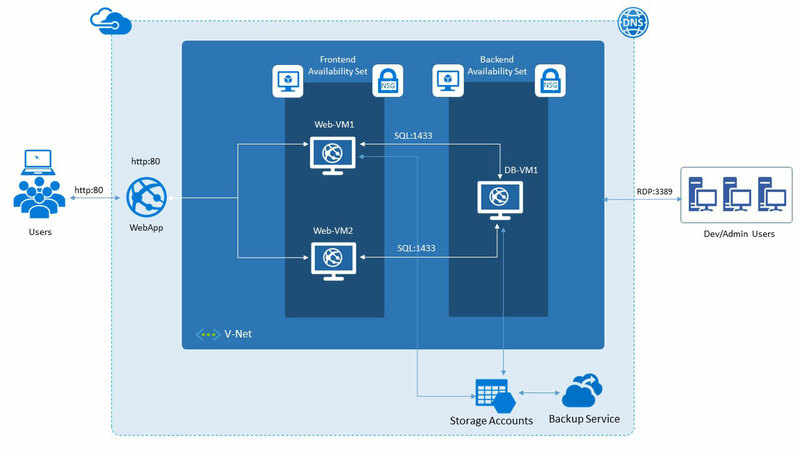 The client was fervently looking to partner with an Azure Consulting team to build a highly reliable and scalable IaaS solution with firewall subnets, virtual networks, geo-redundant triple copies storage accounts and virtual machines with about 99.95% uptime SLA. They wanted a reliable and cost-effective solution to automatically protect their on-premise IT Infrastructure in the case of any disaster or outage. Virtual Machines: Virtual Machines were configured in the availability sets to achieve high availability with over 99.95% uptime SLA. Also, the machines were configured for load balancing in order to maintain peak performance with increase in traffic. Storage Accounts: The SSD storage, called Page Blobs, which creates local triple copies was leveraged for higher IOPS and higher redundancy of data. Also, the Backup Vault was configured for automated data backup to a Geo-redundant storage. Virtual Network: Virtual machines were configured with Network security groups with access control lists and port blocking making them highly secure. Also, an SSL VPN tunnel was established by leveraging Azure VPN Gateway for secured access of the Azure environment for the dev/test/admin users. Azure DNS service: The existing DNS service was moved and configured to Azure DNS service. This resulted in creating a highly available and secured solution in the Cloud, which can prevent cyber attacks like DDOS attacks. Thus, the client’s new Azure IaaS environment reduced hosting cost by 25% and at the same time helped increase the speed of the applications by 25%. Power-up your solutions with Azure & solve real-world business problems. Our consultants brings in expertise to build technology roadmaps and implement modern solutions to transform your business. Enterprises must deal with number of challenges before migrating their existing applications, infrastructure or legacy systems to Cloud. Here are the top ten challenges and ways to overcome them while planning for an Azure migration.